If you suffer from insomnia, one thing's for sure - you're not alone! But you may be wondering if popping sleeping pills is the only way to get a good night's rest and avoid feeling exhausted the next day. The short answer? No! There are loads of natural remedies for better sleep that go beyond warm milk or chamomile tea before bedtime. While these remedies may work for some, they don't work for others. Thankfully, there are a number of lesser-known, tried and tested sleep-inducing foods that are sure to work for everyone. Toss these five gentle ingredients together in your blender, whiz on high-speed and you've just made the ultimate “sleep drink”! 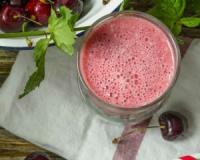 Cherry juice or tart cherries are high in melatonin, which helps control your sleep and wake cycles. Bananas are rich in magnesium, also known as “the calming mineral” because it helps relax your nervous system. Raw honey has long been used as a natural sleep aid as it triggers the release of melatonin. Soy milk is full of tryptophan, a sleep-inducing amino acid, and also contains calcium, a mineral that promotes sound sleep. Nutmeg has the power to soothe muscles and, in turn, relax your mind and body. Diabetic tip: You can substitute the honey for stevia or agave nectar, or skip it altogether to make this smoothie diabetic-friendly. If you’re using cherries, remove the pits. Add all of the ingredients to your blender and blend on high-speed for one minute or until completely smooth. Decant the smoothie mixture into a tall glass. Serve immediately. PS: I recommend drinking this smoothie about an hour before bedtime.